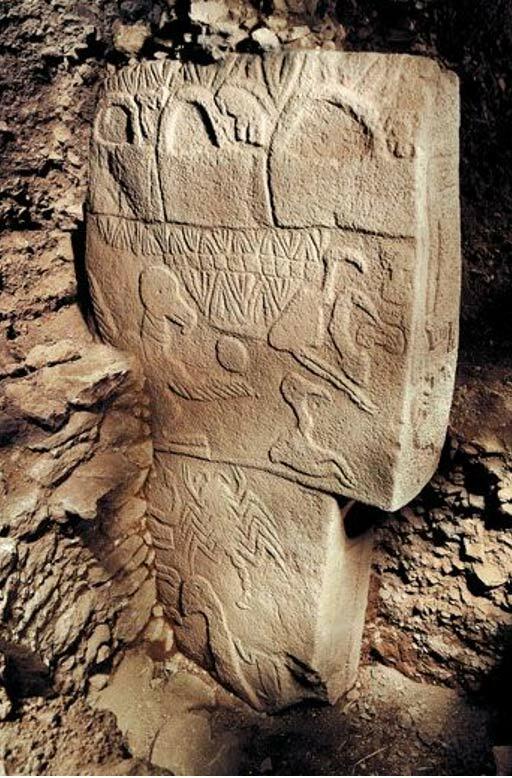 Göbekli Tepe is an ancient and significant site which has been pushing back the beginnings of civilization further than we previously assumed. As each temple, pillar, and engraving at the Neolithic site is excavated, the story of human history is rewritten, and the symbols and messages of prehistoric cultures are revealed. Three baskets can be seen carved along the top of the pillar. The “Three baskets” symbol on the pillar of Enclosure D is also intriguing. At first glance, we may define this symbol as three ordinary baskets. In spiritual cosmology the basket is also symbolic of seasons and the offerings of the first fruit, fertility and sanctity. In the Pentateuch (Torah), three baskets are defined as “three days”. Maybe it symbolizes three specific days of the year. The three baskets could relate to the gates across the horizon at “two solstices and the equinox point” due east/west. Positions of the equinox and solstices. The pillar which this symbol is on looks up to the east direction. The motifs on this pillar – from bottom to top - may represent the travel of shaman's spirit after death, before rebirth. Experiencing death and rebirth is the most important stipulation for obtaining the shamanic power. Maybe it is the origin of Etena's heavenly ascent in Sumerian mythology. Etena's adventure to the sky or heavens on the back of the eagle represents shaman's flight to the upper world. In Turkish shamanism, the spirit of shamans resuscitates three times. Three times are on the days of June 21st, March 21st /September 23rd, and December 21st. Shamans benefit from the believed energies of these days. On this pillar the sun is engraved also. Pillar-18, which is identified as an anthromorphic statue, has a leopard skin hanged on its belly. It does not only symbolize a hunter man. There is much more to it than that. In my opinion, the leopard skin emblematizes the Cosmic Puissance or cosmic power of the shaman. In Egyptian myths, the goddess of astronomy Seshat is always wearing a leopard skin representing the stars of heaven. I can clearly point out that shamans of the Paleolithic, and later Neolithic, had morphed into the gods of Egyptian and Sumerian mythology. “H” symbol is not only a monolith symbol itself. It consists of two parts, which we can define as Tau. 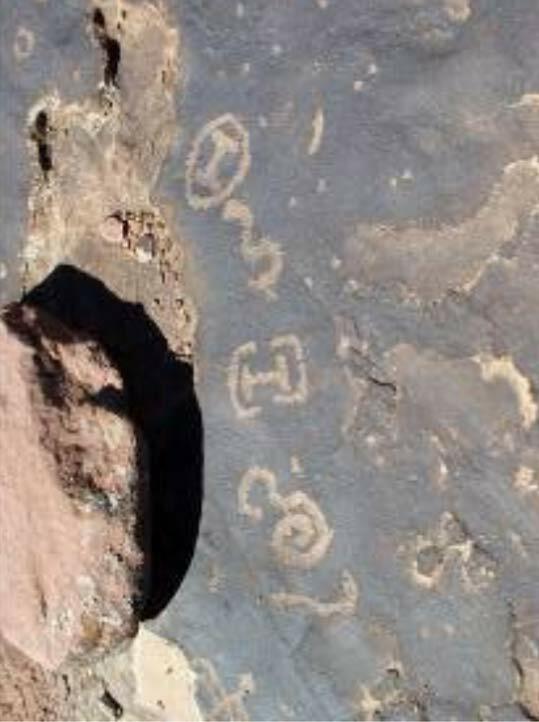 We encounter the same “H” symbol in Utah petroglyphs which are made by Anasazis. Indeed, we see the complete “( H )” symbol. Here the “H” symbol is not alone. On both sides there are other symbols. Ray Urbaniak interprets the “H” symbol to mean double T shapes. Two T shapes butted together form a double T. He also says that Tau represents half of which is in the spiritual world. So, we can imagine that the “H” symbol consists of two Tau symbols. In my opinion, both of the side symbols next to “H” symbol represent the rising and setting sun. This tripartite character matches a verbal expression of mythological ideas about the three states of sun throughout the day (or moon throughout the night). The Ancient Egyptian god says: I am Khepra in the morning, I am Ra at noon, I am Atum in the evening—the names of deities that represent the sun in its various states. The “I” symbol of ancient Mexican mythology not only exhibits a single Tau of two forms, but in different positions, as well as two double-headed figures joined in one, which illustrates the duality, above and below, or heaven and earth. Turkish rug motifs also contain “H” and “I” symbols. The meanings of these symbols are “marriage”, “unity of family” and “faithfulness of lovers”. Sometimes it represents “motherhood”, “fecundity” and “birth”. Among these rug motifs an important one, the so-called “Eli Belinde (Hand on belly)”, seems quite like Göbekli Tepe’s central pillars, upon which we see both hands on omphalos. In Proto-Turkish culture the “I” symbol was called as the “ON: Cosmos”. Interestingly, In Chinese culture “I” symbol represents the shaman or spirit intermediary, so-called Wu. The widespread usage amongst indigenous American peoples of the inverted and upright Tau shape as emblems of the above and below is abundantly proven and doubtlessly arose as naturally as the Chinese characters “Shang: Above”, employed as a symbol for heaven, and “Lea: Below or Beneath”, employed as a symbol for earth. The connection between Heaven and Earth represents the creation of innocence and this is reflected by the central line. So, I can suggest that the mysterious “I” symbol is about a “Heaven (Sky) – Earth connection: so the life could exist”. In shamanic belief, Earth takes its life force from the sky via the navel cord. Göbekli Tepe should be seen as an important site for this reason. (Interestingly, In Turkish “Göbek” means “The Navel”). In this, creative powers unite for birth or rebirth. Therefore, some specific days are vital for taking life energy from the sky or heaven. Life force is believed to be always there, but not always visible. It is believed to be visible on specific days of year. These days are the equinox and solstice days. On the other hand, the “H” or slanted “I” symbol may be about East-West, Woman-Man or God-Goddess connections. The earth and sky motifs, and the rituals represented by these motifs, were probably linked together as a ritual duality. In a duality, neither earth nor sky can exist without the other, and both earth and sky-related rituals were necessary elements in the lives of people, such as seen in the Ho'e'ga; The Osage (Great Plains Native American) ritual name for earth: an enclosure in which all life takes on bodily form. 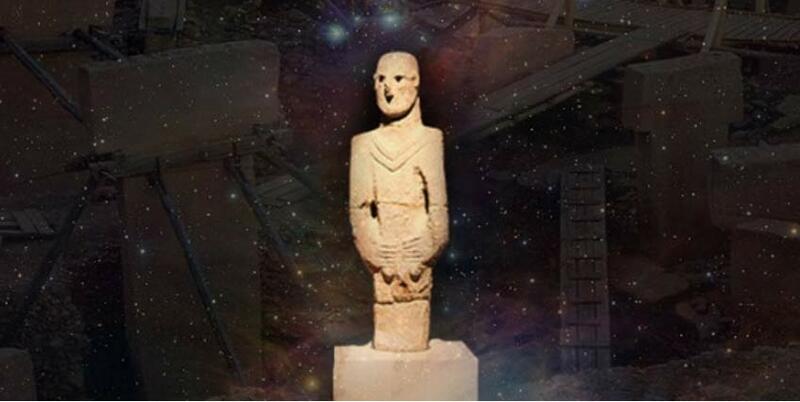 Why can it not be the same in Göbekli Tepe? It is possible that the placement of the shaman is a reminder of the shaman's roles as a ritual functionary and mediator between the natural and supernatural worlds. In this case, the shaman may have also served as a ritual bridge between earth and sky. Images courtesy author Özgür Etli. Klaus Schmidt, Sie Bauten Die Ersten Tempel, Munchen, 2006. Andrew Collins, The Cygnus Mystery: Unlocking The Ancient Secret Of Life's Origins In The Cosmos, 1999. Julian Baldick, Animal and Shaman: Ancient Religions Of Central Asia, 2012. Gary Buffalo & Sherry Firedancer, Animal Energies, 1992. Ray Urbaniak, Significance Of The “T” Shape To The Ancient Anasazi, And Possible Connection To India, 2003. Carol Diaz-Granados and James R. Duncan, The Rock-Art of Eastern North America: Capturing Images And Insight, 2004. The “Three baskets” symbol on the pillar of Enclosure D is also intriguing to me as this is so close to my own cultures symbolism...being that the 3 baskets represent the 3 aspects of knowledge..
3 being the knowledge forbidden to mankind. Give Shamans’ a break for being the foundation for most of archeology’s questionable interpretations. That’s the easy way out of doing your homework - blame it on the Shaman again. The Turkish carpet “H” motif closely resembles characteristics found in high energy plasma characteristics. I suggest the researchers look here for their new homework assignment. Many other motifs found in traditional eastern carpets can be seen replicating these high energy “cosmic” events. I have a carpet displaying many of these characteristics. I find it interesting that the Turkish “I” symbol represents “cosmos”. They got that part correct. Without scientific data, conclusions remain conjecture. I'm interested how H and Tau are connected in the article... I think the whole concept is wrong, personally. The seven birds represent the Pleiades, not the Big Dipper or the Sun, Moon, and 5 planets. https://sites.google.com/site/fromthedeepoceanabove/ The Gobekli Tepe site shows 12 constellations and the Bull and the Sun (the central monoliths) as in Gilgamesh and all this is confirmed by 2P/Encke. The Egyptians and the rest of the world's mythologies also confirm it. It is all about being hit from space. The Sun fighting the clouds that block it caused by the interaction of the Earth with Spacefalls.